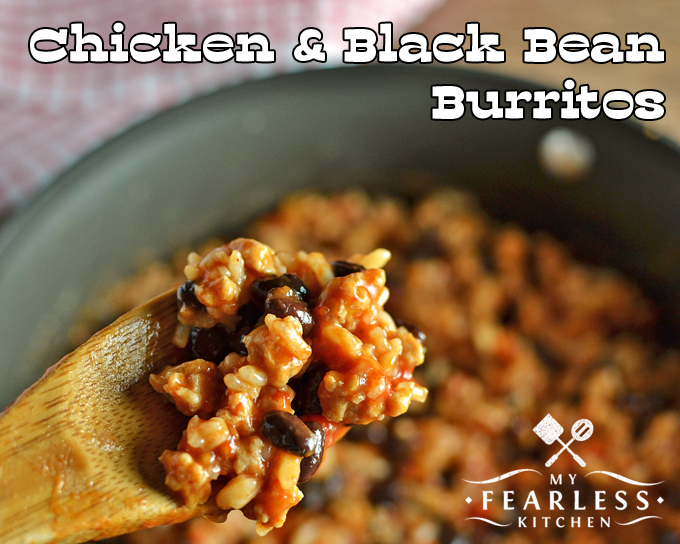 This Chicken & Black Bean Burrito recipe is so fast to put together! They make an easy weeknight meal, and a different twist on taco night. Do you have a regular taco night? Do you always have the same thing? 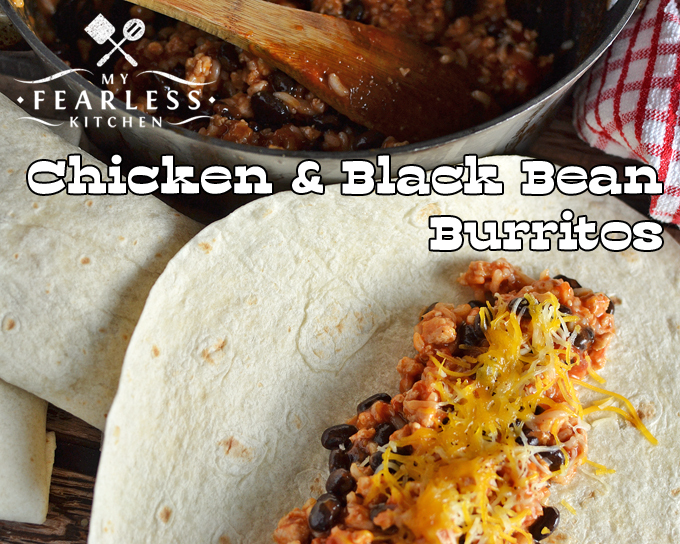 Try these Chicken & Black Bean Burritos for your next taco night instead! I used ground chicken for these burritos, because, well, why not? We very rarely eat ground chicken, so I thought it would be fun to try. 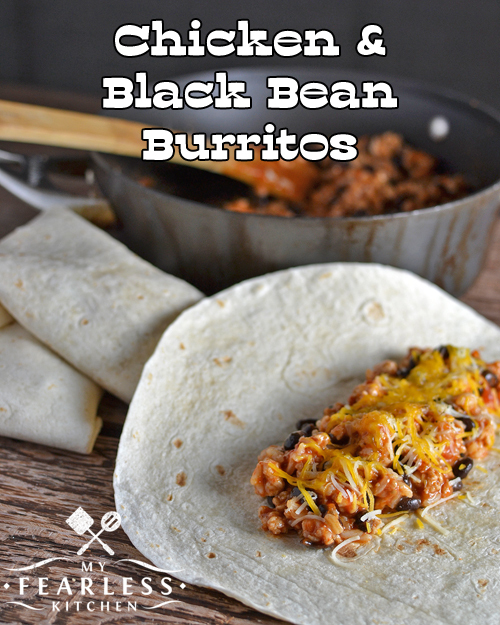 You could easily use ground beef, pork, or even turkey in these burritos instead. Pick your favorite, or experiment with something new! Brown ground chicken the same way you would brown ground beef. Pre-heat your skillet, then add your ground meat and mix it up. I love my Pampered Chef Mix N Chop for this job. A little chop and twist, and the ground meat crumbles just as finely as you want it! Once the chicken is cooked, just add everything else to the skillet, mix it up, and let it heat through for a few minutes. The sauce will thicken up a bit as it cooks. Want to make it even faster? Cook up a bunch of Crockpot Ground Meat ahead of time. Use any ground meat you want, cook a big batch in your slow cooker, then freeze it in 14 ounce portions. Grab it out of the freezer the night before to thaw in your refrigerator. I did need two pots to make these burritos – a saucepan to cook the rice in and a large skillet to brown the chicken and then combine everything else. If you’ve got some rice stashed in your freezer, just add it (still frozen) to the cooked chicken. The frozen rice will take a few extra minutes to thaw in the skillet. But by the time your sauce is bubbly and thick, the rice will be hot, too. Then just spoon the burrito filling onto burrito-sized tortilla shells, add some shredded cheese, and wrap them up! You could also use the meat as a filling for tacos in smaller tortillas, or as a topping for nachos. Why is Ground Beef Brown in the Middle? In a large skillet, brown ground chicken. Add black beans, tomatoes, rice, enchilada sauce, and salt. Mix well. Cook, uncovered, over medium heat for 5-10 minutes until sauce is bubbly and thick. Spoon mixture into the center of 6 burrito-sized tortillas. Top with cheese. Wrap burritos.